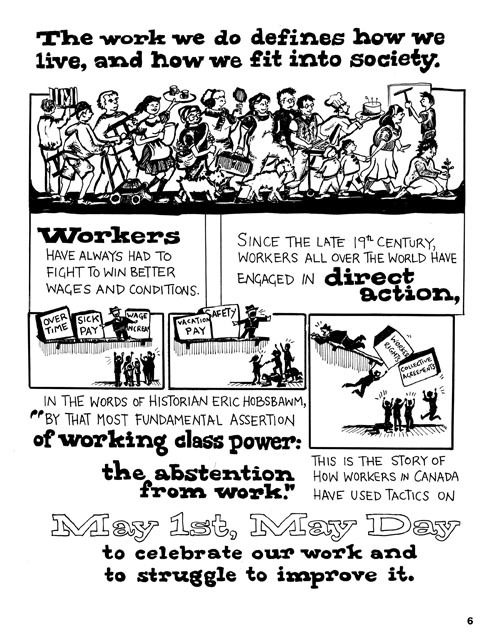 “The work we do defines how we live, and how we fit into society.” That’s the first sentence in MAYDAY: A Graphic History, recently re-published by Between The Lines Press for the group known as the Graphic History Collective. To me, the depth in that simple statement speaks volumes. It’s on the first page of the book, but it’s probably my favourite panel. MAYDAY is an entry-level look at labour history, and as such is more P.S.A than prose. I’m pleased to be able to share this interview with Sean and Robin of The GHC about this project. In it I feel they’ve offered some important insight on how politics and history can be simplified without being dumbed down… the trials of indie comic book publishing, and the ongoing importance of a political holiday that began with blood more than a century ago. 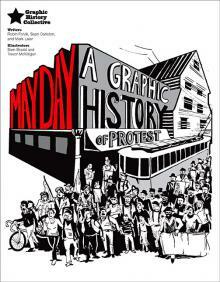 NMG) I like the way that Graphic History highlights the importance that Mayday has had for working people through the ages, and its transformation from a seasonal/cultural holiday to a socio-political holiday. From your research, when were the earliest expressions of Mayday in relation to labour contracts? NMG) How long did this take, from beginning to end? (Robin) “The history I usually find most inspiring wasn’t part of what I learned when I was younger. Once I began to study history seriously–and moved to a larger area where there were bookstores and bigger libraries–I had the opportunity to more critically engage with ideas. I realized a lot of what I had thought true was actually limited in scope and that the stories were always much more complex. “This myth-busting component of history really appeals to me, and carries over into my interest in politics. The two are very much linked, and the past is frequently referenced to make political points in the present. History is used as a means to define or shape identity, which in turn influences decision-making processes in many ways. NMG) The larger audience outside of comix culture has been pretty slow in realizing that comics aren’t “just for kids”. Most comics written and published today are for the 20 – 35yr old crowd. Who is MAYDAY’s intended audience? Were you picturing a particular readership when you were writing/drawing? NMG) How did you create this comic as a collective? What was the division of labour? 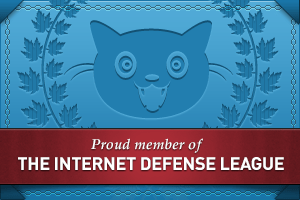 Did one person research while another wrote – or did everyone research? How did the writers contribute to the graphics? etc…. NMG) I’ve recently seen postings by the Collective to collaborate with readers and followers on other historical events. Can you say a little about the ideas and aspirations of any future projects right now?